Put on your thinking cap and massage your funny bone - it's time to come up with some creative captions for the Duct Tape Guys’ photo file. We will post a new photo here every month for you to submit a funny caption to. Just e-mail your caption with your name, and e-mail address. We will award fabulous prizes every time to the two best captions (and post other honorable mentions). your caption with your name and e-mail address to caption contest. Deadline is 3/28/09 (If it goes a bit longer - don't dismay - we're probably out duct taping something. Scroll down for last time's winners. 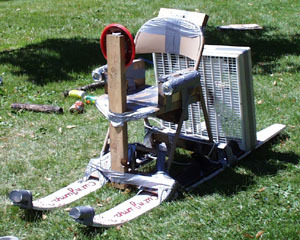 George Lucas' original plans for Luke's speeder before he got funding. - Peter J. VanZwoll Congrats, you won a Duct Tape Pro button, bumper sticker and set of six postcards. Need help being creative? Check out The Duct Tape Guy’s hints for Brainstorming and Creative Thinking for more help in becoming a creative dynamo! Keep it up! The way to have a good idea is to have LOTS of ideas!